Poured from the bottle, this sauce is smooth and green, with small flecks of spice throughout. Just a nice, jalapeÃ±o green, not the artificial, fluorescent tinge you sometimes see in other sauces. The aroma comes through with heady notes of cumin and pepper – a real pavlovian saliva starter. The flavor backs this up. 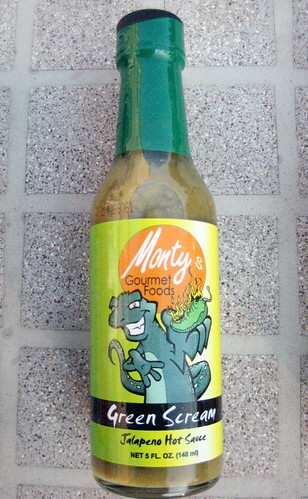 Given the cumin backbone, this is a sauce that would work well with tacos, burritos, or other standard “mexican” fare. It’d work well jazzing up a bowl of lax chili. Straight-up on the tongue, the vinegar and garlic notes come through a bit more. No real taste of vegetative jalapeÃ±o (the primary ingredient). Although emblazoned with flames on the label, this is a relatively mild sauce. I plowed through half a bottle in one sitting, and was left with pleasant warmth and a mild rush of scalp perspiration. Mission accomplished, I’d say! Green Scream is the real deal. While it won’t “work” with everything, on the foods it agrees with, it’s a very pleasant sauce. Great to have you back & reviewing Bill! Why the deleted post Anthony? You see… this is what I don’t get. If it was my review you would be all over the fact that the bottle wasn’t open and there wasn’t even a mention of the type of food that was eaten with it. I took pictures of all of the bottles the day I received them. It was the first day of sunshine here in about a year, so I took them outside to my deck and took the pictures there on the table. As to the food, I ate this sauce on tacos, and later, chicken fingers. It went better with the tacos. I never disputed anything Bill – I just seem to take the heat for most of these things and pointed it out. Anthony you little whinner, grow up……… You want to know why nobody responds to your reviews anymore, because you whine when anybody says something about your review…. Since they stopped posting on your review I guess you got lonely and thought you would High Jack another review…. you kill me…… Let it gooooooooooooo…. Bill did you notice the band was not staight? Thank you for not using this sauce on Mac & Cheese….lol…. This is where your ignorance comes into play – I never made the mention about the uneven band. If you paid attention to the article it was edited and that was not something I wrote. I surprised you wrote back and not your girlfriend……. My point to your ignorance and stupidity exactly – thanks for validating! Darwinism at its finest! Or at least a great lack of Karma – something I thought you would understand since you are such a big fan of Bl…..
Leroy is my buddy, I’ll give him a call in the morning. He’s not going to be happy with this Anthony fellow!!!! Just as long as Anthony doesn’t have dog! You gotta be careful with Leroy and dogs! Big Show…. You coming to TO with The Creator for Defcon Day? No, that’s a trip I just can’t fit into the schedule right now with everything else going on. I’m sure it will be a good time though. To funny, if you even had a clue what goes on behind the scenes, you would see what and ars your making of yourself right now……lol….. Think about why where the SB, Mac and Cheese sets even posted…. Why such a great response? 1 Prototype set sells for over $200 thanks buddy…. Hahahaha – Funny thing is I know EXACTLY what goes behind the scenes. I have been privy to many a confidential e-mail. You have your few fans but that is about it. Anyways – enough of this – cause I am not going to play your games. If it wasnt for the HSB you would be nothing. You already got one….lol…. The only one left is my personal set….lol… I guess for the right price..
God I love Karma…. Life is good…..
Blane, my SB set rocks, Im glad to have it my brother !!!! How many other folks have a signed Mac and Cheese box like the 1 you sent me in rehab? That is priceless to me bro !! Where did my post go?????????????????????????????? I see Anthony is already deleting post……. Afraid of what someone might think…. to funny, people have already read the post…. no way out of this one Anthony. Someone deleted my post about wanting a SB set? and all the prototype sets? Thanks AJ, your a good friend Brother….. I have 2 windows open luckily, why did you delete that stuff Anthony? Chill dude, it’s just a blog man…. Anyways, Im off to the kitchen to play with some Fatalli mash and 1 mil extract, should be interesting. Later !!!! Take care Jack….. be careful with that extract. ok, deal…..how much for all of them? how do i buy a regular set 2? go me, i found i still had my original post 🙂 yeah!! that browser back button can really be cool! Yeah, usually all the time I have ebay, mail, a label program, and the blog in windows bouncin around, I spotted the missing post count then found the deleted posts, lol. Blane that means it a collectors bottle. If he has a dog……OOOOHHhhhhhhh boy he better keep it lock up. Anthony if you see a little guy with a plaid shirt on and buck teeth and a helmet on and maybe his fly open . Don’t be alarm It’s just Leroy looking for a new friend. Dude you are too funny!!!! !..Anthony just leave the post alone please.You come on here and make dumb comments then you expect people not to bust your chops..Maybe this is your way of getting people to comment on your reviews or maybe not..who knows who cares..but please dont edit the post that just makes people dislike you..alot!!! Also after reading this comment i have one further comment to make!!! You say if it was not for the HSB Blaine would be nothing? My friend it is cause of HSB you are nothing!!!! Am I still in Que…. Bret tell LeRoy thanks for the back-up. #1701 just passed eman, sorry buddy…. What did I win. I hope it’s a new dog. My old dogs keep running away. Hey, my count is about 30 posts off….whats up? What I wanna know is…. why did my humble little green sauce cause such a frenzy of hate and discontent? It’s actually not THAT hot a sauce. Now DEATH LIZARD on the other hand…..